Studies have shown that having a cluttered work environment decreases productivity so taking time to get organized will really help you to focus and work well at your desk. 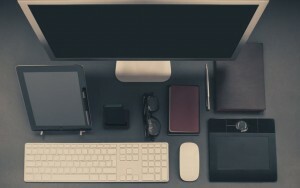 How do you get organized and stay organized in your work space? Your space doesn’t have to be completely sterile but you should not have your entire collection of shot glasses from various vacations or your collection of snow globes cluttering your workspace because this decreases the amount of useable space that you have to work on. I have a terrible habit of keeping old ink cartridges for my printer to reference the type of ink I need for replacement but I don’t need to do that. I should just take a picture of the old cartridge and throw it away. This frees up more space to work. Try not to keep stacks of paper on your desk. Instead keep an inbox on your desk that coworkers can put important documents in that you need to take care of. Make an attempt to work through the papers each day to prevent a backup. You don’t have to keep a physical copy of every single document. You can scan important documents and keep PDF copies of files instead of keeping boxes of papers that you may not need. Keep a small trash can near your desk and use it to dispose of waste as it comes up rather than leave items on your desk that you just don’t need. Oftentimes in offices, there are some materials that are common team items that are shared like a stapler or shredder that is not used often enough to justify everyone needing their own. Sometimes we borrow something and end up keeping it, so purge your office of any items that can go back to the public areas and prevent clutter in your area. All of us get junk mail and end up leaving it lying about just taking up space. Make a habit of sorting the mail before leaving for the day from work to avoid excess clutter. You don’t have to keep every document or piece of paper that crosses your desk. Assign each paper a date to get rid of the document so you don’t have to deal with it later. Many projects last more than one week but that doesn’t mean you have to keep all of the documents from the project on your desk. Each week file away the work from that week so that you can start fresh. I have a terrible habit of keeping stacks of magazines because there is one article that I want to read so what I started doing was cutting out the article that I want to read and recycle the rest of the magazine. Part of getting organized initially is clearing the piles of paperwork that you have lying around. Part of organizing your office is decluttering your drawers so that you can easily find what you need quickly and easily.